After a successful career in textile design and fashion retail management Debbie founded Wee Yarn Designs in 2013. 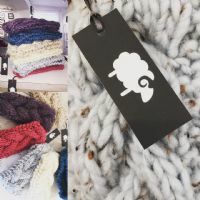 Based in Newtownards she specialises in the design and creation of hand knitted fashion pieces and bespoke baby knits using 100% natural Irish yarns. Using an earthy colour palette based on the use of natural luxurious yarns such as merino silk, cashmere, cotton and linen her work exhibits a clear contemporary edge whilst still acknowledging the use of traditional skills.